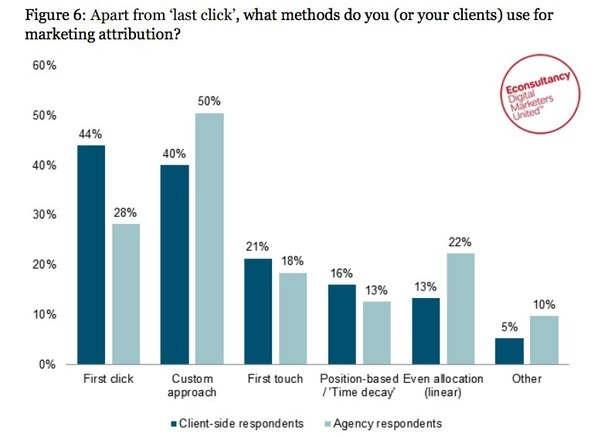 I’ve been thinking about marketing attribution over the last couple of weeks. I’ve been talking to a some very interesting companies – and one of the big questions that I’ve been asking them, is how do they break down the online sales process and assign a correct weighting to the channels that contributed to the sale. The “sale” could be a sign-up, could be a deposit, or a purchase – basically anything that is core to how you’ve set-up your funnels or goals. What’s been interesting is that there still seems to be a real struggle to move away from a simple “last click” metric to a model that assigns a weight to the different online channels that may have significantly contributed to the sale. For example, let’s say someone was buying a new coffee-maker. They may Google it first, and end up on a coffee-maker site, browse a little and leave. They then go to another site that is on an ad network that’s retargeting and when they are on that site they are presented with a banner (from one of the coffee sites that they’ve visited), they click on that banner and go back to the coffee site. Often the final step, when the decision process is done – is price comparison, so the coffee-buyer goes to a price comparison site, gets the best price and ends up on the first site again, as it has the product they are looking for at the best price. Now they decide to buy. Under the “last click” model – the sale is recorded under the affiliate channel (more costly to the vendor), and when the coffee site owner analyses the sales results, the assumption is that the affiliate channel contributed 100% to the sale – therefore we need to invest in the affiliate channel more. However, it’s clear that there were actually a number of different online channels that ultimately contributed to the successful sale. SEO contributed, paid media contributed, as well as the affiliate channel. 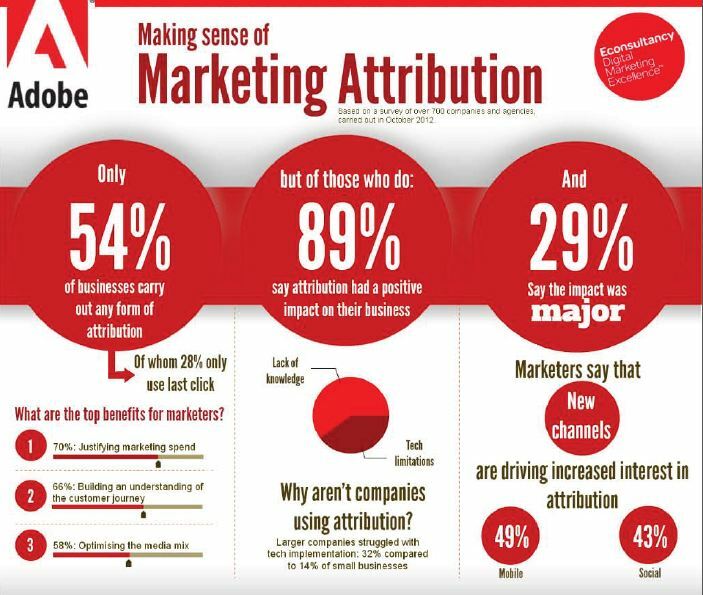 Adobe published an interesting study at the end of 2012 that offered some interesting insights into how companies attitudes and approaches to marketing attribution. 700 companies surveyed. 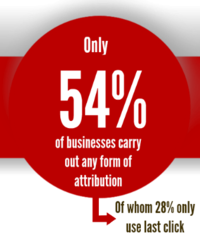 Only 54% carried out any sort of attribution but of those that did 89% said that it had a positive impact on the business. You can see the report in more detail – here. The #1 barrier to being able to implement successfully, seems to be a technical one. Based on my own experience, it’s newer, nimble, tech-savvy firms that have the technical smarts and the know-how to be able to implement marketing attribution better. Knowledge is less “siloed” than it is in older, larger firms. There is a more holistic approach to data interpretation that older firms are struggling with. The single-click model can also hold a lot of sway when it comes to internal politics in companies as the SEO team don’t want to lose success to the Affiliate team who don’t want to lose out to paid media – so people tend to fight for their “last-click” success. This needs to be addressed by Management – and people need to be made aware the it’s all about overall business success – rather than short-term team gains. Paid Advertising and Referrals were also undervalued in most cases. Cluster & establish baselines: Use the database that you’ve already got to cluster customers into groups. Look for similar patterns of behaviour from the data that you’ve got. Are your lower value customers coming from Paid Media or Search? Use these to formulate baselines of behaviour. Integrate your Analytics: An obvious one, but one that can be a significant challenge to many organisations. CRM analytics need to be linked to Google Analytics that need to be linked to your other metric touchpoints. Ensure offline is accounted for and that your mobile analytics don’t get lost in the mix. What tools do I think are good? Google Analytics. Optimove. Omniture. comScore Digital Analytix. Qlickview. Find them via Google! Some good scholarly articles here. Data driven marketing attribution models here.